The much-vaunted panzers of the Wehrmacht wreaked havoc across Europe early in WWII, conquering all before them. However, when faced with the tremendous tracts of the Russian steppes, the massive Soviet army and its resourceful industrial production capacity, Germany began experiencing an acute shortage of tanks. One solution was to put captured tanks into German service. And with the T-34 being the most successful Soviet tank design of the war, this was a logical tank to re-enter combat on the German side. 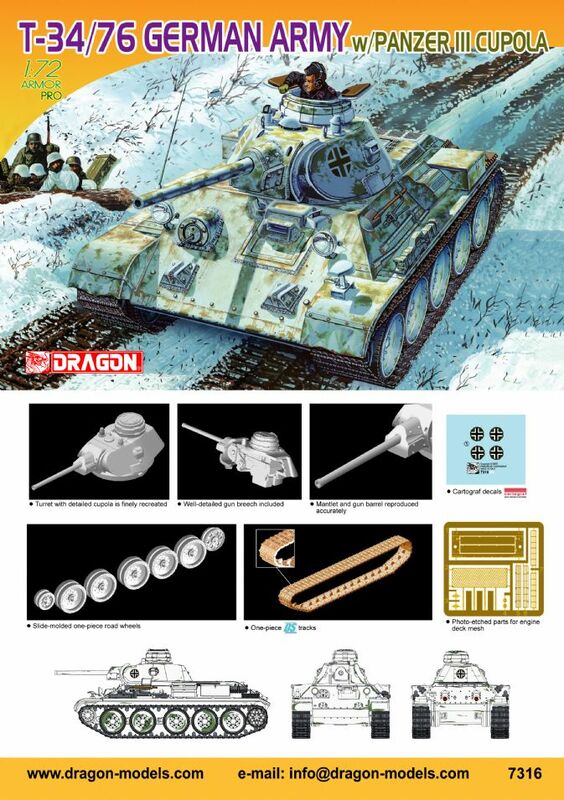 Dragon has released a new 1/72 scale model of just such a T-34/76 Model 1941 tank in German service. A 1/35 scale kit of this tank has been previously released, and this smaller version loses none of its detail or accuracy. This smaller T-34 has received all the appropriate German modifications such as a Panzer III cupola on the turret for the commander, German tools and equipment, and a Notek light. Dragon’s considerable technological expertise ensures that that the kit is finely engineered and very easy to assemble for modelers of all abilities. The kit contains DS tracks, which offer simple and convenient assembly. Cartograf has produced a set of high-quality markings that offer relevant German national and tactical markings. The T-34 was a highly successful Russian design, but on this occasion, Dragon offers a new twist with this novel “German” T-34/76!